Bob has the Power, and Bob and Mallet are properly communicating. Bob wishes to hold the power and use it properly. 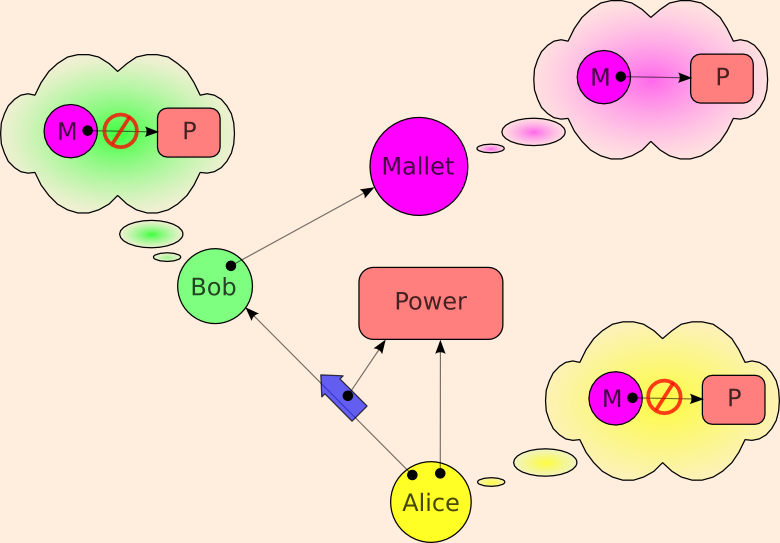 However, he wishes to deny the power to Mallet, and Alice trusts him to do so successfully. Alice considers Bob her deputy in the use of this Power. Can Mallet confuse him into providing the power to Mallet? See the original paper. Netscape calls this problem a "Luring Attack". The main punch line of the tale of the Confused Deputy is "Don't separate designation from authority." A Capability is a pure opaque designator that coveys authority. An implication is that all names are local. The next punch line is "Don't separate authorization from invocation". Even in systems where designation and authority have been kept together, if authorization is separated from invocation, deputies will still be confused. SPKI is an interesting case to examine, as it is a very capability-like (and capability-inspired) system that nevertheless makes both of the above mistakes.